The new "Staging Diva Home Staging Consultation Checklist With Room-by-Room Client Planning Forms" is really two products in one. 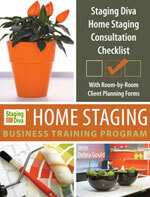 There are still some spots open in the April Live Staging Diva TeleClasses. I only take 15 students in a conference call. All notes are emailed to you in advance. You get a phone number and password to join your fellow students and me in the live calls on the 5 designated evenings. I just finished shooting the final segment for a new HGTV show, I'll let you know when I have an air date and I'm hoping to have my home office makeover story included in an upcoming issue of Entrepreneur Magazine. No word yet. It's been a whirlwind of activity behind the scenes for several months now for the Staging Diva Team. I'm finally able to share with you some of the new things that have been in development. I'm proud to introduce the NEW Staging Diva Home Staging Art Shop! You can now order art online and have total flexibility to choose whether you want the work printed on paper or canvas, mounted and framed, or gallery wrap. It's all up to you, including the finished size. Read more about it in this issue. You'll also read in this issue about the new Home Staging Consultation Checklist with Room-by-Room Client Planning Forms for those of you who want your consultations to be more of a "fill in the blanks" exercise. Thanks to my Executive Assistant Sandy for coming up with a way for you to easily find all the products and services on our website! We've created a new Staging Diva Store which links you to everything that's available. 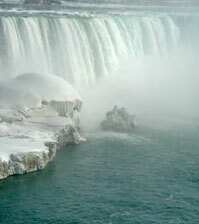 I escaped for a few days of March Break to go to Niagara Falls and learned the first person to go over the falls in a barrel (and live) was a 63 year old woman in 1901! She hoped the ensuing fame would allow her to retire from teaching. It didn't and she died penniless at the age of 83. You can do something remarkable like this woman, or just be very talented at what you do every day. But if no one knows about it, you won't make a living from it. That's why I spend so much time on marketing in the Staging Diva Home Staging Training Program. I want my Graduates to have a lucrative business, not just a creative hobby with a business card. While in Niagara Falls, we stayed at Great Wolf Lodge. Boy, do they know how to take a theme and run with it! As a stager, it was fun observing all the careful propping in every public space: from tents, fake trees and animals, to snowshoes, canoes and antique wash boards. I hope you find the content of this issue of Staging Diva Dispatch helpful. I welcome your feedback and/or new story ideas! Best wishes for the spring real estate season and may all your dreams come true in 2008! P.S. If you missed the Preview session I ran recently, you can listen to a recording here. P.P.S. I'm working on a list of what I call Stupid Staging Tricks. I'd love your contributions, read more here. Go to Interior Design School or Be a Stager? The goal of any home staging project is to create an environment where potential buyers fall in love with a home and imagine living there. Well-chosen and well-placed art has a huge role to play in creating the right mood for home buyers. It enhances the perceived value of the home, warms up sad places, and can even make a less than ideal wall color work. For home stagers who have had trouble sourcing rental art for staging or who want to build their own inventory the Staging Diva Home Staging Art Shop makes it easy for you.I've hand-picked 100 pieces of art suitable for home staging and told you which rooms I recommend them for. And, as a Staging Diva Dispatch subscriber, I'm giving you 10% off all framing, matting and canvas wrap options between now and May 15. Plus you'll sa.ve. 10% off museum art prints. All you need to do is use this special code when you're at the checkout: StagingDiva10. Don't forget, the point of building your own art inventory is to make "passive revenue" from it. In other words, you buy the art and then you rent and re-rent it to your clients. Within 3 months you should be able to make back your investment and then all rentals that follow are pure pr0fit for you! I've done some of the math for you on the new website so you'll see what I mean! By the way, the idea for this art shop came to me after I was interviewed for the Wall Street Journal about the role art plays in staging. I took the ideas I shared with the reporter and created a special report, Staging Diva's Top 10 Tips for Using Art in Home Staging. You can get it f/ree when you visit Staging Diva Art Shop. If you use the story on a website or blog, "www.stagingdiva.com" must be alive link back to http://www.stagingdiva.com. On your mark, get set . . . sell! The spring months are traditionally the busiest time of the year for the residential real estate market. The weather is more cooperative and many families like to move while the kids are on their summer break. But wait, in the US it's still a buyer's market. What can homeowners do to catch the buyer's eye and get them to make an offer this spring? How can a home stand out from the competition when there are several homes for sale at similar prices in the neighborhood, or worse on the same street? Before you lower expectations along with your selling price, there is a far less costly option to consider - staging the home for sale. Home staging is simply the merchandising of a house to capture the hearts and bids of potential buyers. The objective: making a good first impression; the purpose: to help make buyers see that the price is right. However, it's going to take more than a fresh coat of paint and a new welcome mat. A buyer's market raises the stakes, and you may need to do more work on your home to get the highest price possible. Cleaning, painting and repairing. As a homeowner, you may be falling into the trap of complacency. Often we are so used to our own homes that we cannot see them through the eyes of a buyer. It's the Home Stager that can make that leap for you by figuring out how to showcase the best features of each room. 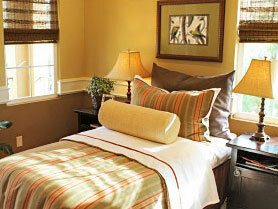 Or in the case of a vacant home, a professional home stager can help add that homey feeling an occupied home exudes. However, do not confuse staging with decorating. Decorating means personalizing your space and staging is about depersonalizing it to make it appealing to any home buyer. I had one client last July whose agent wanted him to cut $50,000 from his asking price after the home had sat on the market for four months without a single offer. For the agent, the reduction in the list price would have been about $750 out of her pocket. For the client, however, that's a loss of $47,000! John called me instead and spent about $1000 and got 98% of his original asking price when he received three offers the following week. Honestly, why wouldn't everyone stage their house with those sorts of numbers and that kind of turn around? I can only imagine what his house might have sold for if he'd had the benefit of a Home Stager's advice when he first went on the market in the spring. Congratulations to recent Staging Diva Graduate Susan Atwell of Atwell Staged Home (CT) who joined the Directory at the end of January and had her first project from her listing within 2 weeks to completely stage a vacant condo. She writes, "Just this one job more than paid for the cost of joining the Directory and all my Staging Diva training. Anyone considering a listing should not hesitate to join because a listing on the Directory is a powerful marketing tool." Congratulations to new Staging Diva Graduate and Staging Diva Network member Elizabeth Englehart of Moving Designs (OH) on her first staging project worth $8,000! She's doing a vacant home that's been on the market two years. Elizabeth writes, "Thanks Debra for such an amazing training program that gave me exactly the right tools and knowledge to enter this business with confidence." Congratulations to recent Staging Diva Graduate Nicola Thomas on her new website. Nicola wrote me, "The Staging Diva Training Program is amazing! I downloaded the 5 course recordings and was surprised to see that they really do cover every aspect of running a home staging business. I know this year will be great thanks to this fantastic course and the confidence it's given me to move ahead with this new stage of my life!" Adam Luttrell of Shift by Design. This is the first International listing for the Directory. Adam is based in Hobart, Tasmania (AU). Click through from his directory listing to his website. It's fabulous and a great chance to see well-presented homes in Australia! By the way, Adam has much Internet experience from his previous job and joined the Staging Diva Directory specifically because he understands the search engine value of having a high traffic site link to a new smaller site. Adam is also a great contributor to the Staging Diva Network Online Discussion Group. Congratulations to recent Staging Diva Graduate Josée Biron of EMBELLISSiMMo Home Staging (QC) who tackled the difficult task of having a bilingual website to promote her services. Congratulations to recent Staging Diva Graduate Michelle Lane of Center Staging, LLC (NJ). Her second staging project went under contract within 3 days of her staging the home and over the asking price! You can learn more about Michelle in the Staging Diva Network Online Discussion Group. or Become a Home Stager? Many women approaching their 40s write to me wondering whether they should go to Interior Design School. It’s an issue I struggled with myself many times over a 20 year period. I interviewed a number of interior design schools at various points in my past career but never followed through on actually applying. I already had a BA, an MBA and years of experience. The thought of being a full time student for 2 to 4 years, with a bunch of kids 20 years younger than myself was not that appealing. And the cost was huge considering the significant income I’d be giving up over that period. Anyone who has been reading my newsletter or taken my courses knows that I'm a huge believer in the power of marketing. But, marketing has a dark side when it's not practiced with integrity. Wild claims are made or things are presented in misleading ways. Or, the marketer plays to your fears and insecurities to get you to buy. Are you being promised a guaranteed home staging "job" upon completion of a training program? There's no such thing because home stagers are independent businesses. If they were to hire a home stager to help them, it wouldn't be a full time "job," it would be project by project. So claims about guaranteed employment should raise a red flag as well. Are you being told you'll be left out in the cold if you don't take a specific program because suppliers won't deal with you? That's nonsense. It's a competitive world out there and furniture rental companies, storage companies, junk removal services, etc., want your business no matter what training you've taken (or not). Of course you can still negotiate discounts with them if you have your own staging company. And I teach you how to do that in course 5. You don't need someone else to do it for you and you'll always get a better deal if you build the relationship and negotiate for yourself.